OK, I am slightly addicted to self-help books, I'll admit. So great is my addiction, in fact, that I have devoted the last 5 years of my life to studying them while writing my doctoral dissertation on the history of self-help literature in Australia. 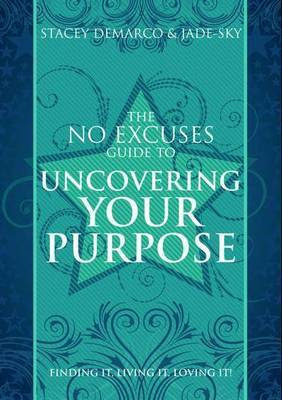 I have just read an overwhelmingly inspirational book from Australian authors Stacey De Marco and Jade-Sky, called The No Excuses Guide to Uncovering Your Purpose. A big focus in this book is self-care, on respecting your own needs and desires, and in doing so coming more alive to your own potential. 1. Get out into nature: One of the book's authors, Stacey De Marco, is a modern witch, and as such is part of a tradition that reveres nature and recognises its importance in our spiritual lives. The book advises getting out into nature every day, something I often forget to do. All of us need to spend more time with our bare feet on the ground, and not on cement. 2. Ask the Universe for help: So many of us are hung up on the idea of being rugged individualists, on being totally self-reliant. But sometimes this just isn't good for us. Learn to ask for help in a way that is non-invasive and empowering. Throw your needs out there and let it be known that you could use some help. You'll be surprised. 3. Remember what you loved as a child, and re-introduce some of those things into your life: Do you ever stop to think of the things that enchanted you as a child? Comic books, aimless walks, swimming in freshwater creeks, watching B grade monster movies. All of these things nurtured us and fed our imaginations. Going back to them might just help spark some important part of your memory. 4. Get familiar with mythology: For 80s kids, Clash of the Titans (the original!) was a really big movie, and for me it brought to life the ancient myths of the Greeks. How I loved that film! But as the years have progressed, I have became a little shaky in my memories of Greek mythology. I also want to acquaint myself with Celtic and Nordic mythology, all of which has so much importance in Western literary culture. These stories carry incredible power. Learn them again, and you will begin to see them re-created everywhere. 5. Take small steps toward your dreams: Going all the way is often impossible. But we can always do some small thing to move us towards our goals and dreams. And once you start, these baby steps really start to add up. Pretty soon, you are a long way towards achieving what you wanted. Don't think you have to change your life right now. Just do something small, and repeat again tomorrow. 6. Attend seminars: Hardly anyone does this. Self-help guru Brian Tracy says about 4% of the population ever attempts any kind of self-improvement in adulthood. That just seems unbelievable to me. Why wouldn't you want to learn new things, to stretch your horizons? Be a doer. Sign up for classes, workshops, seminars. Consider systematic study and check out university courses. It is NEVER too late to get an education. Be interested in life and be excited about learning from others. 7. Be prepared for a journey, not an instant enlightenment: Just because you want it doesn't mean you will get it immediately. Almost anything worth having takes work, persistance and patience. So many people give up, just at the point of achievement. Don't be so easily disheartened. Prepare yourself mentally for setbacks, rejections and occasional boring patches. That's life. The key to success is a willingness to get up again the next morning and keep going. You're walking a path, not jumping off a cliff. Schedule an encounter with nature once a week for the rest of 2013. Record the impact this has on you, in writing, and note any revelations or ideas that occurred to you while out and about. I'd love you to share these with me in the comments, and maybe come back to me at the end of the year and tell me if you have noticed any positive effects in your life. In January I will be having an inspirational coversation with Stacey De Marco, one of this book's co-authors, at Ultimo Community Centre (Library) in Sydney. This event is now booked out, but if you are keen you can still register to go on the waitlist here. 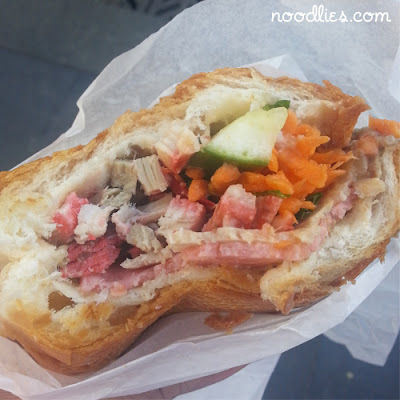 Vietnamese food, especially in Australia is known for two things, taste and value. I remember, when growing up, being amazed at how many ingredients go into a typical Vietnamese dish and how much time it takes to cook a good meal. A bowl of pho involves cooking beef bones for hours and adding a bewildering number of spices including coriander seeds, star anise, cumin, fennel seeds, black peppercorns, garlic – and they are just the spices I recognise. The depth of richness in the soup also comes from salt, ginger and of course fish sauce. And more is added to the pho at the table: bean sprouts, chilli, basil and hoi-sin sauce. Next time you order a $10 bowl of pho, take a minute to appreciate all the effort. And it’s the same with a banh mi thit (Vietnamese pork roll) over 10 ingredients including three types of meat, pate, mayo, pickles, chilli wrapped in a crusty, crunchy long roll. While a chicken and avocado sandwich might set you back $8, you can get a pork roll for as little as $3 and it’s not just in the Vietnamese hubs like Cabramatta, Marrickville and Bankstown - a very decent pork roll can be had for $3 in Penrith! Pork rolls are the un-sung heroes of fast food, perhaps the original subway! Pork roll shops are spreading all across Sydney - next time you pop off to your local hot bread shop, check to see if there’s a counter in the corner. A tip, if I may: avoid it if there’s sliced lettuce anywhere in the vicinity! Earlier this year, I undertook a stomach churning search for Sydney’s best pork roll – a crazy chomping frenzy stretching from Hurstville to Penrith and in between. At the end of the six weeks, I announced the winner of Sydney’s best pork roll. Since that time, it seems like more and more pork roll places have popped up. One of the more recent is an all-out assault on Sydney’s CBD, with the Pork Roll shop in Sydney’s George Street diagonally across from World Square. A tiny frontage that is just enough for two pork roll making counters, early on it was only an amazing $3.50 for a pork, roll but within months that had gone up to $3.95 – which is still pretty amazing value. Noodlies finally got the chance to give it a test drive and I’m very, very pleasantly surprised. It’s the best Vietnamese pork roll I’ve had in the city; crispy roll with an lovely ‘just right’ colour – not under cooked or over-cooked, all the ingredients are there, all pretty authentic – no skipping corners, there’s even pickled carrots, spring onions and sliced chilli – two types of condiments too, soy and salt and pepper. A few minor, and they're very, very minor observations: firstly, it could have done with a tad more pate and mayo which would have made it more creamy, the meat had a slightly strong five spice after-taste (fine for me, but may not be to everyone’s taste) and finally the soy sauce was a little light. But please, readers, these are very minor issues in an otherwise excellent pork roll that’s under $4k. Oh, +1000 likes for the crunchy roll! If you want to read more about Vietnamese pork rolls get the current edition of SBS Feast Magazine for my full page ‘break-down’. 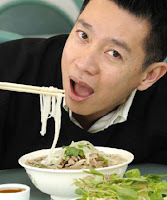 Thang ngo is the publisher of Noodlies, Australia’s number one video food blog. It's no secret that I am a fan of Maximilism. My home is filled with religious kitsch that could easily furnish several temples and a couple of churches. And that's across all sects and denominations. Once, when I took my brother-in-law to visit a Buddhist monk living in a small suburban cottage that had been turned into a temple, he said, "This guy's a lightweight when it comes to statues. Your house looks more like a temple." While some criticise me for filling my house with devotional tat, I like to think I am curating one of Australia's foremost collections of popular religious art. So you can imagine that one of my favourite programs on television was ABC's constantly fascinating The Collectors. Each week it showcased hoarders and accumulators after my own heart, people who collected irons and vintage handbags, plastic bangles and condiment packets. 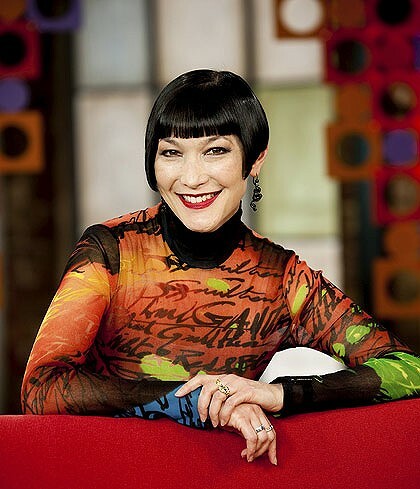 My pleasure in the series only escalated when they appointed the single most fabulous woman ever to appear on Australian television: the extraordinarily beautiful and stylish Claudia Chan Shaw. Then my viewing became obsessive, and I was panting every week to see what the utterly chic Claudia would be wearing as she trawled through sheds full of penny farthings and attics hung thick with 70s wallpaper samples. Imagine my pleasure when I discovered that Claudia has just published her own book, a fascinating overview of the world of collecting: who's doing it, what they're collecting and where they get it. 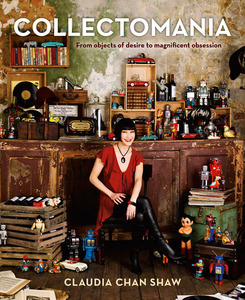 Collectomania is not just a beautiful and fascinating book. With Claudia's eye for detail you just know the photography and layout is going to be extra special. It is also beautifully written, filled with anecdotes and the compulsive stories of the constantly-peculiar fraternity of world-wide collectors. There is also the occasional and tantalising peek into Claudia's own collections, particularly her obsession with robots. Collectomania is a book that will liberate all the bower birds living amongst us, and it is actually a terrific read, making even the most obscure collecting impulses come alive with stories, information and fascinating trivia. I was drawn in to her discussion of Bakelite and the several forms of early plastic that so liberated the fashion world when they were first made available. Who knew that plastics could be so fascinating? Claudia charts the history of collection, reminding us of the Wunderkammer, the cabinets of curiosities collected by noblemen in an infinitely more charming age. As she points out, many of us have our own secret little Wunderkammer, boxes hidden away filled with strange souvenirs of our life, particularly our youth. Mine actually sits right on my desk, a hand-made wooden box that my computer monitor rests on. It hasn't been opened in years, but I know exactly what's in it: a couple of pieces of vintage Comme des Garcons that will never fit me again, some great jewellery pieces I wore in my dance party days, some notes and letters, a pair of fishnet stockings (don't ask) and a card deck I was given on my eighteenth birthday called "52 Handsome Nudes." Among other things. Collectomania will bring back wonderful memories of items that loomed large in your childhood, and it will also inspire you to start taking seriously your own collections. It's a tremendous read, from cover to cover, and makes a gorgeous Christmas present, with its rich photographs. Available at all good book stores and on-line. Sing and pray for the earth! Participate in this gorgeous, global event at Pitt Street Uniting Church, Sydney, this Sunday, 18 November 2012. 3pm start. All welcome. The Good Earth Singers is an organization dedicated to building community through song. Its latest global campaign is One Earth. One Voice. 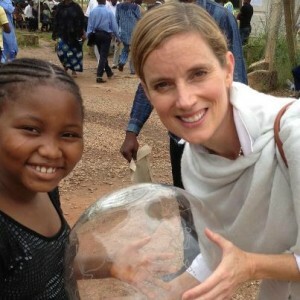 The campaign, led by classical singer Shyla Nelson, will rally 15 million people worldwide to learn and sing a Nigerian song, “Ise Oluwa,” for an unprecedented global event on 21 December 2012 to celebrate and heal the earth. Meet Shyla and learn about her extraordinary, courageous journey when she joins Rev. 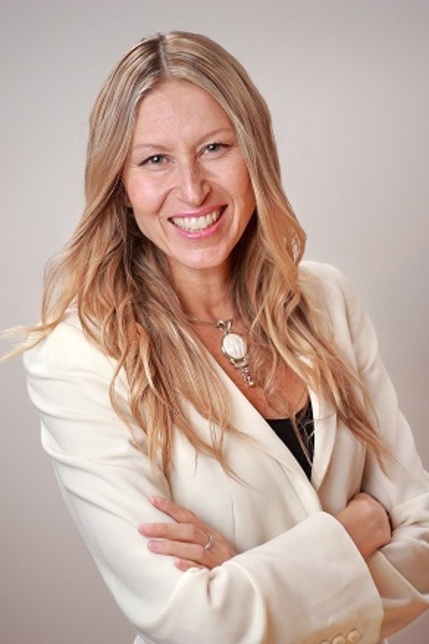 Dr. Stephanie Dowrick’s special interfaith service at 3 p.m. on Sunday, 18 November in the Pitt Street Uniting Church, 264 Pitt Street, Sydney, with representatives of many of Sydney’s leading community choirs. At the end of the service, concluding with Shyla’s testimony and community singing, Shyla and the congregation will walk to the Royal Botanic Gardens to sing “Ise Oluwa,” ahead of the global moment of song on 21 December 2012. The Sydney event at Pitt Street Uniting Church, with Shyla Nelson, hosted by Dr Stephanie Dowrick and Elizabeth Lecoanet, Director of Sydney Sings, is open to all. The December event will be broadcast online at oneearth-onevoice.org. To follow Nelson’s journey visit the One Earth. One Voice. website at oneearth-onevoice.org and The Global Earth Singers Facebook page. 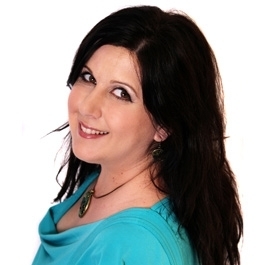 Shyla Nelson is an internationally-renowned classical singer and voice trainer. She founded The Good Earth Singers in 2009 to empower communities and take positive action to improve the local and global environment. As a solo artist, Nelson has been acclaimed as a soprano of “consummate artistry and vocal grace” whose concert and operatic appearances have delighted audiences throughout the U.S. and abroad. She has also collaborated with multiple Grammy Award-winning musicians Paul Winter Consort. The Good Earth Singers is an organization dedicated to building local community through song. Its mission is to develop and support the songful celebration of our common humanity and our deep, devotional connection to the earth. GES helps anyone, regardless of experience and background, learn how to offer his or her voice in service and celebration of this loving earth on which we live. To learn more and join the global One Earth. One Voice. choir, visit www.oneearth-onevoice.org. Anyone can add their voice to the global event and learn the Nigerian song, “Ise Oluwa” on Dec. 21, 2012 by downloading the free smartphone app, “Sing!”. For too long Western Sydney, a vast and diverse swathe of urban culture, has been absent from Australian literature. 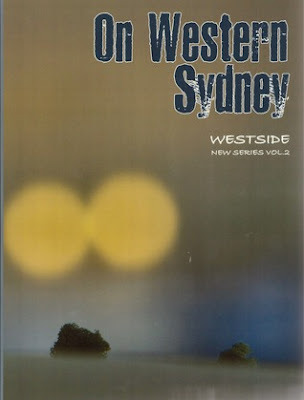 On Western Sydney is a collection of poetry, stories and observations that reflect life in this most fascinating and exciting part of the city. The young voices represented in this amazing collection are the true representatives of an urban space that is demonised by the mainstream media and more or less ignored by the cultural elites. 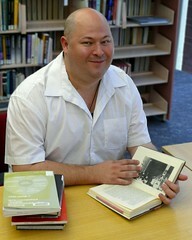 "On Western Sydney is about the real Western Sydney, the people, the places and the experiences. Chief Editor of Westside Publications, Michael Mohammed Ahmad says the publication challenges the limited and negative perceptions of the Western Sydney community that have been presented in popular culture." There is an extraordinary depth and diversity represented in this book, and I think it represents an important moment in Australian - and particularly Sydney - literary culture. For a long time I have been waiting for the rest of the country to wake up to the fact that it is in Western Sydney that the real stories are happening, and where the real art is being created. On Western Sydney might just represent one of the first, and best expressed, steps toward that awakening. I love the collections challenge and its variety. 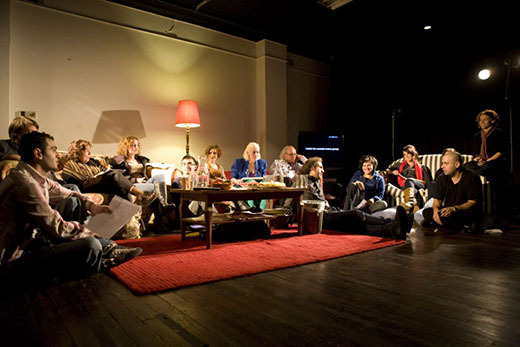 It incorporates the work of some well established and celebrated writers like Felicity Castagna, Fiona Wright and Pip Smith along with a score of other, newer voices. All are grappling with themes that are not rigidly regional. Even if the vocabulary belongs to a particular place or moment, the themes are universal and almost always compelling. WIN! A copy of On Western Sydney. See if you respond to the "Westie" voices and are stimulated by the diversity of styles and themes in this remarkable collection. Entries close Wednesday 21 November, 5pm. Australian residents only. Judge’s decision is final. Winner will be notified via email by Thursday 22 November, noon and must respond with a delivery address by Thursday 29 November, 5pm. My intrepid other-half, the wonderful Mr. Noodlies himself, Thang Ngo, has a one-page feature in the latest edition of SBS Feast magazine. It has just hit the streets - it's the one with the delicious Italian Berry Crostata on the cover (man, I have to try that). Thang pulls apart the banh mi (or pork roll or Vietnamese sandwich) and lets readers in on the essential elements of this iconic Vietnamese snack. So grab a copy of the mag and learn at the feet of the master. He eats a LOT of banh mi. Last night I was at Kinokuniya in Sydney for the launch of a new novel from Jo Anderton. 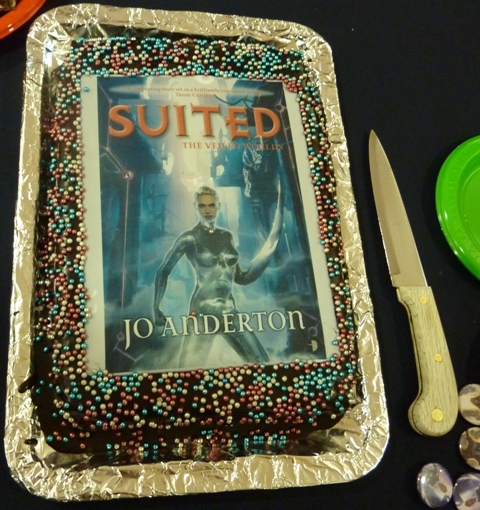 A book cake! 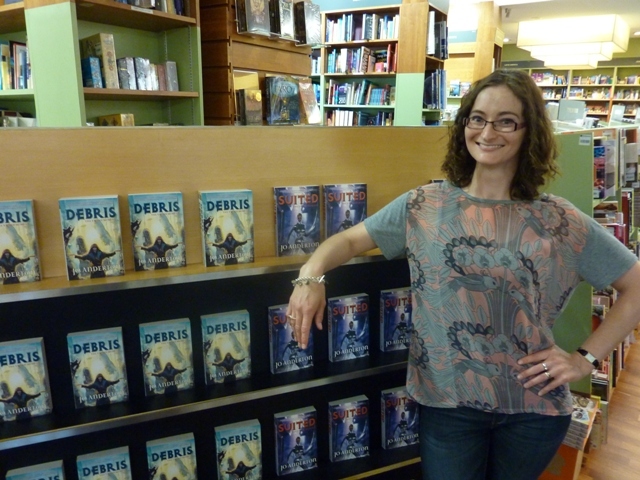 I'm going to do this at my next launch! The book, Suited, is the second in her speculative fiction The Veiled Worlds series, and it looks like so much fun. I can't wait to get started and to lose myself in those worlds - I bought the first book, Debris, as well, so I know I am going to get hooked. 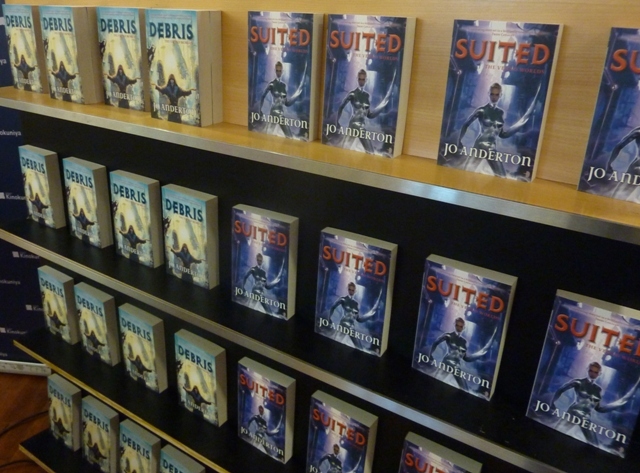 Jo Anderton, author of Debris and the brand new Suited. 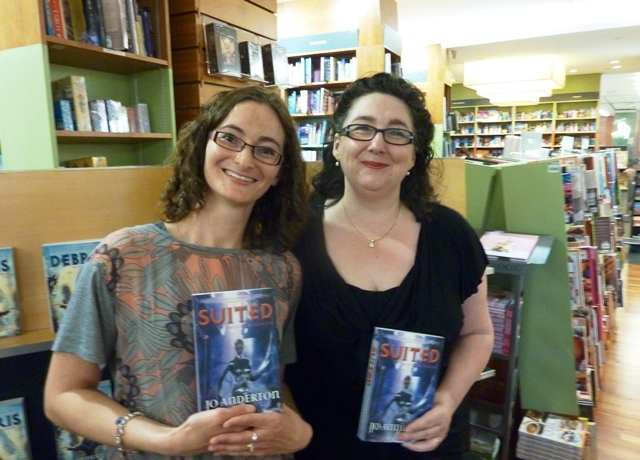 Suited was launched by Aurealis award-winning author Pamela Freeman, who reminded us that she had competed against Jo's first book, Debris, for that same award. 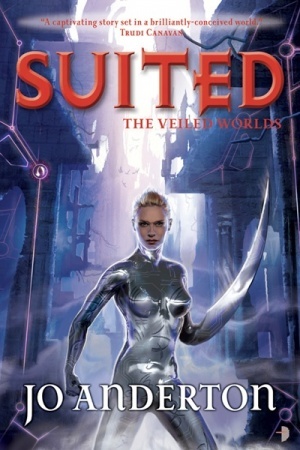 Pamela described Suited as balancing on the knife edge of science-fiction and fantasy, and she praised Jo's willingness to "do really bad things to her characters." Suited is the second installment in a planned trilogy, so get going now!